Thanks to Anthony and Michael Donini, sons of M/Sgt Sanzio S. Donini (Engineer), for information about this crew. Sgt Joseph L. Slotter, Jr. and Sgt Arthur B. Fannon, 24th Squadron gunners were wounded by flak during the raid. In spite of their serious wounds there men stayed at their positions and continued to man their guns as the plane was forced to leave the formation, becoming a target for enemy fighters. Fire from their guns kept the enemy fighters at bay. They were awarded the Silver Star for their gallantry in action. 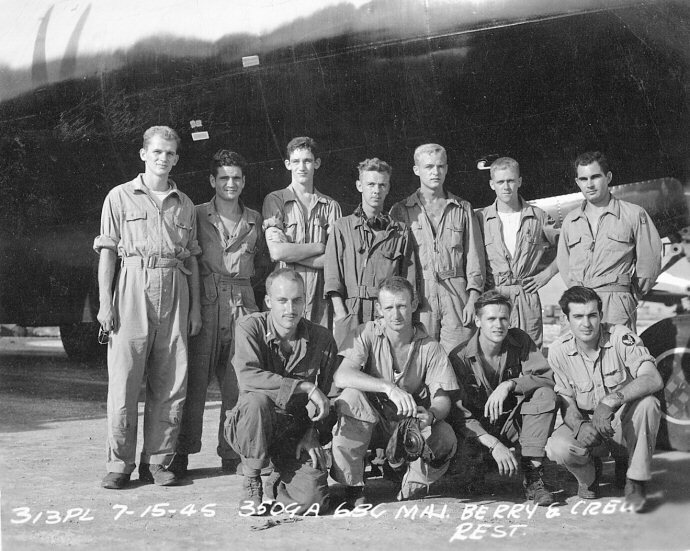 A picture of the crew with Maj. Erskine Berry, C/O 24BS, who flew with the crew on a few missions. Maj. Berry is in the front row, left side. M/Sgt Sanzio S. Donini (Engineer) is in the back row, second from left. Photo courtesy of Anthony and Michael Donini, all rights reserved. This crew primarily flew "Tinny Ann".